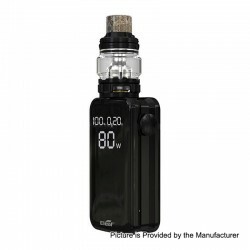 The Original Eleaf iStick Nowos 80W Kit consists of the iStick Nowos 80W 4400mAh VW box mod and ELLO Duro sub ohm tank. This item also has other colors to choose. The Original Eleaf iStick NOWOS is leading the way with the innovative LED digital display and touch buttons, where aesthetic looking meets easy operation. It houses a mighty 4400mAh battery which can reach a maximum power of 80W and supports QC3.0 / PD3.0 protocol for faster charging than ever. Another revolution is the use of TYPE C. Unlike older USB cable, it doesnt matter which side is up with the TYPE C.
The ELLO Duro sub ohm tank is a 28mm Clearomizer with a 6.5ml capacity, it comes with two new kinds of dual mesh coil: the HW-M Dual 0.2ohm coil and the HW-N Dual 0.25 ohm coil, bringing you the best vaping experience.